The 2015 Bulldog football team had one primary aim in mind Friday: finish out the regular season with a win and a district title. That an abundance of athletes were able to have a hand in accomplishing that goal was just icing on the cake, as the ‘Dogs defeated Lovington 53-22 at chilly Bulldog Bowl to cap off a 9-1 campaign and a second consecutive District 4-AAAAA championship. The Bulldogs got off to a somewhat slow start against the Wildcats but held a comfortable 26-0 lead at the half on the merits of a 17-point offensive showing in the second quarter and a first-half shutout by the Orange Crush defense. The D also contributed a safety to the intermission tally. After bumping the margin to 31 in the third quarter, Artesia’s backups were able to take the field en masse on both sides of the ball, keeping the excitement level high through the final horn. “Probably the best part of last night’s game for our football team overall was the fact that we were able to play lots of athletes,” said Henderson. “Any time you can do that, it’s not only going to help you for the future but also right now, because those are the people out there in practice every day helping us get better. The ‘Dogs came out firing Friday. 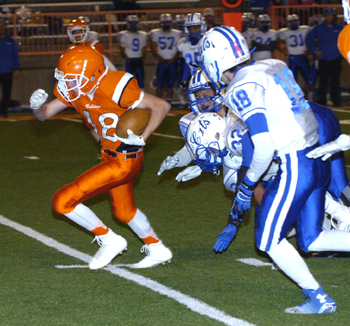 Grady Frost rumbled an extra nine yards with the opening onside kick by Lovington to set Artesia up at the Wildcat 37, and the offense needed just four plays from there, going up 7-0 85 seconds in on a 10-yard touchdown pass from Justin Houghtaling to Daniel Leon. From there, however, the O would fall out of sync until midway through the second quarter, turning the ball over on downs, punting twice, and fumbling deep in Lovington territory in between. The defense kept the Wildcats from capitalizing throughout the opening half, however. A pair of punts and a turnover on downs carried Artesia’s 7-0 lead over into the second, and following another three-and-out, lineman Codey Scott wrangled Lovington running back Isaiah Hinson to the turf in the end zone for a safety that made it 9-0 with 7:47 on the clock. The offense wouldn’t squander the quick return trip onto the field, as Houghtaling found Ethan Duff twice from the 50, the latter for a 21-yard catch-and-run TD that put the ‘Dogs up 16-0 with 5:58 to go in the half. Another three-and-out by the Crush gave way to a six-play, 71-yard scoring drive that featured a 36-yard toss from Houghtaling to Darius Ramirez and culminated in a four-yard dash over the goal line by Isaiah Weideman with 3:27 remaining. 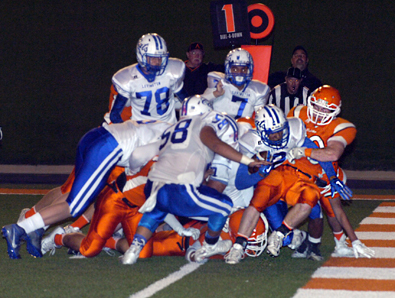 Artesia had a chance to reach the checkerboard again in the final series of the half, converting once on fourth down to breach the red zone. But with time running out, they opted for a 30-yard field goal, which Tanner Harris delivered to set the 26-0 score at the break. The Bulldogs would make it 32-0 midway through the third on a one-yard plunge by Weideman, and the ‘Cats would get on the board for the first time just over a minute later when – spurred by a 52-yard pass from Brook Quinones to Kenneth Oliver on their first play from scrimmage – Quinones found Oliver from 10 yards out, then tacked on the conversion. 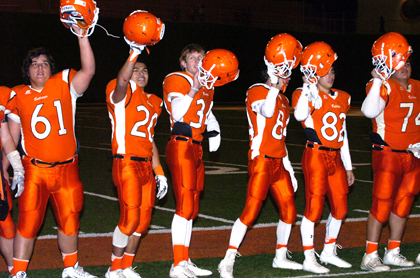 The ‘Dogs would answer immediately, however, on a 45-yard touchdown bomb from Houghtaling to Daniel Hernandez to bring Artesia four points away from the mercy-rule margin with 4:43 to go in the third. 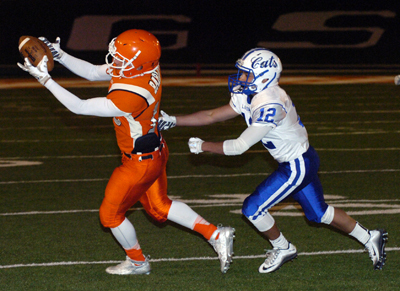 Following a Lovington punt forced by a sack of Quinones for a loss of eight by Cooper Hall, Artesia would bridge that gap on an 11-yard TD pass from sophomore Taylor Null to classmate Tyler Greenwood with 50 seconds left in the quarter. But the ‘Cats would slow the clock 42 seconds into the fourth with their second touchdown of the night, a 38-yard pass from Quinones to Caden Bailey that made it 46-15. 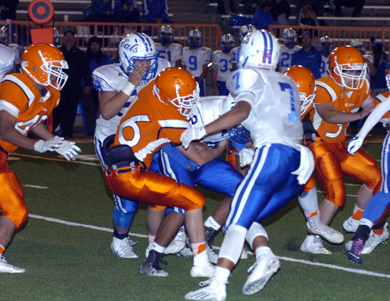 Lovington would continue to experience success offensively against Artesia’s second-string D, scoring once more on a 13-yard Quinones-to-Oliver connection to cap a 99-yard drive. The ‘Dogs’ first possession of the fourth quarter would end in an interception at the Wildcat one to start that series, but the offense would put the lead back over 30 with 1:04 left to play on a two-yard touchdown run by sophomore Robert Fernandez. Lovington was able to reach midfield as the final seconds ticked away, but a sack of Quinones for a loss of 13 by Blake Pruitt – also a sophomore – ended the game. Houghtaling finished his abbreviated evening 27 of 37 for 402 yards and three touchdowns, while Null finished out with a 12 of 17 showing for 152 yards and one TD. Fernandez led the ground game with seven carries for 54 yards, and topping a receiving corps that consisted of a whopping 14 athletes on the night were Hernandez (5-127), Duff (5-81), Greenwood (5-63) and Leon (5-53). Quinones was 24 of 40 for 337 yards and three touchdowns for the ‘Cats, while Hinson logged 51 rushing yards. 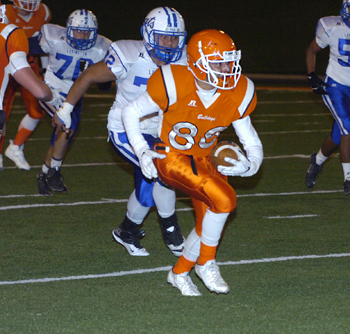 Artesia outgained Lovington 585-385 on the contest, with the Wildcats posting 265 of those yards in the second half. “We were really pleased with the fact that we were able to pretty well shut down Lovington’s offense to start the game,” Henderson said. “We had a lot of series with three-and-out performances, and our kicking game is still coming through and getting us good field position. With title in hand from Class 5A’s most competitive district, the Bulldogs (9-1) were seeded No. 2 Saturday night in the playoff bracket behind top-ranked Las Cruces Centennial (10-0). The Hawks went 5-0 in their district – which consists of Los Lunas, Chaparral, Valencia, Belen and Santa Teresa – by a combined score of 257-63, defeating their stiffest competition, Belen, 48-28. Fellow District 4 squads Roswell High and Goddard were seeded sixth and eighth respectively. Artesia will be taking on the winner of No. 10 Los Lunas vs. No. 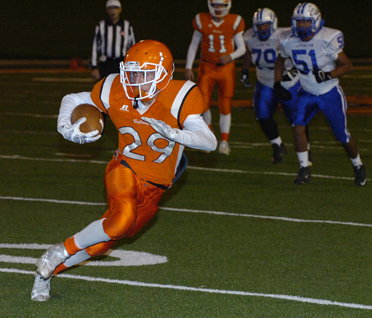 7 St. Pius in the Class 5A quarterfinal round Nov. 20 or 21 at Bulldog Bowl.